Why should I switch with Currys/PC World? 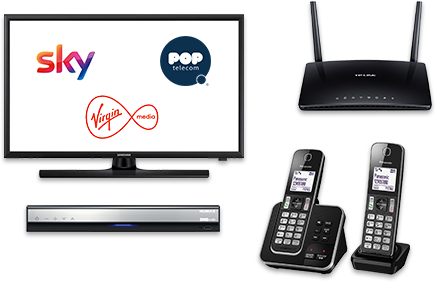 We offer free and impartial advice to allow you to compare thousands of broadband, home phone and digital TV deals so you can find the package that best suits your needs. Call free on 0800 093 3992 or click here to find the best deals. Will switching to a new contract save me money? If you haven’t switched your broadband, home phone or TV supplier in the last few years, chances are you are on your supplier’s standard deal and pricing. Switching your services often means you can make huge savings for up to 18 months. There are often great deals for new customers offered by the UK’s biggest suppliers to help you save money. And if you bundle your services, you can get great broadband, content and calls for an even better price than separate deals! What happens to my old contract if I switch? If you decide to switch, your new supplier will take care of cancelling your last contract for you. Your new and old suppliers will send you notification of the switch, detailing service affected as well as any cancellation charges. Our switching support service will be available throughout your switch to offer you any support or advice you need to get everything ready to go as soon as possible – you can contact them on 0800 542 4704. How long does it take to get set up with my new supplier? Many of our customer’s find they can be up and running within just three weeks. However, this can vary depending on circumstances, supplier and location. Our switching support service will be available throughout your switch to offer you any support or advice you need to get everything ready to go as soon as possible – you can contact them on 0800 542 4704. And don’t worry – if you’re not happy with our new service you have the right to cancel within 14 days. Can I choose a different deal to the ones recommended? Of course! If you don't think our recommended offers are the right fit for your household, then we'll be happy to help you look for a deal that works better for you. You could also browse through the fantastic range of packages on offer from all the UKs providers using our simple online comparison table here . Most broadband connections use your existing phone line to provide your internet. Line rental is the fee you pay your service provider for the use of this cable, and is included in the monthly cost displayed. For most providers, you have to pay the line rental, even if you don’t use a landline phone. If you opt for a supplier with their own fibre network, for example Virgin Media, then you won’t have to pay the line rental. What does ‘first year cost’ mean? This is the cost of the package for the entire first year of the contract – this includes your monthly cost as well as any upfront fees you may have to pay. What does ‘broadband speed’ mean? Broadband speed is measure in megabits per second (Mbps) – the higher the speed, the faster the connection. Broadband speeds in the UK can be over 30Mbps, going up to 300Mbps for the fastest fibre packages. The speed advertised is the maximum speed that you could get – it could be much lower depending on factors such as time of day, and how many people are online at one time. What speed you need depends upon what you use the internet for – if you’re streaming movies and TV over the internet, you’ll need a higher speed than if you use the internet just for sending emails. Our advisors are trained in helping you choose the speed that best matches your internet needs. How do I claim my when purchasing a TV and broadband package? Please visit https://redeem.curryspcworldcashback.com/gb/en/pages/mp/home to claim your cashback and to answer any questions you may have. If eligible, you’ll receive your gift card 28 days after the installation of your services have taken place. When will I receive my cinema tickets? If eligible, you’ll receive a text with details on how to register 28 days after the installation of your services have taken place.